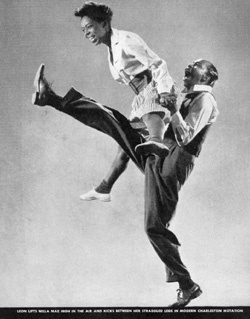 Russell Williams Leon James, one of Whitey's Lindy Hoppers, had one of the greatest on-stage personalities in Lindy Hopping. With his constantly moving legs and hands and his flashing eyes, everyone would always notice him first. His styling was a favorite of the ladies at the Savoy, who still like to remember the way he moved his hips. 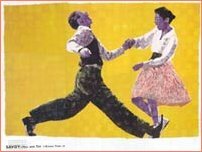 He and partner Willa Mae Ricker were featured in the 1943 Life Magazine spread on Lindy Hop, along with the white Broadway dancers, Stanley Catron and Kaye Pop whose picture appears on the cover. The photographs of individual dance steps by Gjon Mili are sensational. Merry-Go-Round Because of poor eyesight, Leon was one of the few of the original Lindy Hoppers who was not drafted into the service in World War II. He remained active as a dancer and stage personality until his death in the 1970's. He and fellow Lindy Hopper Al Minns developed a novelty act in which they danced together and charmed audiences with their playfulness and ingenuity. Together they served as informants to Marshall Stearns and his wife Jean when they were writing the classic book, Jazz Dance. It seems that the playful pair had a lot of fun at the expense of the Stearnses and of posterity. Their fanciful ideas of gangs at the Savoy and other uptown drama are regarded as fact by many who have read the book. To their defense, none of the Lindy Hoppers of that time, including Norma Miller and Frankie Manning, had any sense that they were making history. To Leon and Al, a good time at the moment seemed to be what mattered most. Their dancing together is both brillant and playful. They can be seen dancing together in Jazz Dance, The Spirit Moves, and Chicago and All that Jazz. Written by Judy Pritchett with Frank Manning. Copyright, 1995, 1996, 1997,2003.May not be reproduced without written permission. <judyp@mcn.org>. Last update 21 April 2003.